"The house is little more than a service core set in infinite space, or alternatively, a detached porch looking out in all directions at the Great Out There." The exhibition titled Odds & Ends: Take One, after Bob Dylan and The Band’s infamous Basement Tapes recorded in 1967 around Woodstock, features Peter Acheson, Susan Meyer, Jill Shoffiett, and Jeff Starr. For the exhibition, organizers Meyer and Starr selected artists whose work mirrors their interests in the fiction of stability and permanence found in concepts of shelter. The theme for the exhibition Odds & Ends comes both from a track on Basement Tapes and from the want by the artists/organizers to reject categorization. By calling attention to these recordings, made during Dylan’s convalesce from a motorcycle crash, we contemplate Dylan’s artistic choice to reference the site—basements—of their production. What type of architectural condition or shelter is a basement in relationship to creative production? In general, by looking to the architectural—the built world—we enter a process of reconciliation with acknowledged histories: proposed, real or imagined. In a world where everything seems named and archived, basements might be the last architectural space to be described beyond function, type and construction. If they become described for their atmospherics like kitchens and bedrooms, they will certainly enter into the process of concretization that ultimately makes them a consumable product. As it stands now basement space—Dylan’s and all—is more of a mental thing, an underground site. Hefty, yet intimate, abstractions by Peter Acheson appear pulled from the shadows of an imagined glossary of architectural elements. In the painting Yau, titled after the mathematician Shing-Tung Yau who proved that string theory is a viable unified theory of nature, we see abstracted geometric or cartographic symbols—circle, triangle, cross, and house—loosely collaged in the corners of the painting. In the background of these symbols, a forest green mountain-scape emerges amid fog-colored swooshes. Acheson presents these symbols to communicate spatial information predicated on reality, on theories of nature, but offers us a map to a fictive place. Like the sanatorium in Thomas Mann’s The Magic Mountain the altitude of this painting seeks the curative resolve of science for stability. The symbols perform as acts of preservation, an action taken to enshrine an imagined past. Which past is Acheson addressing: painterly space or production and presentation or the space of encounter? Yau, and the other Acheson paintings in Odds & Ends, offer vertical constructions of impermanence and destabilization that present nature retained by the aesthetics of the built world. Considering the fiction of the social system presented by Le Corbusier’s proposed 1925 Plan Voisin, we look to Susan Meyer’s seemingly ramshackle skyscraper tower, House of Windows. Le Corbusier’s skyscrapers were intended to be “translucent prisms that seem to float in the air without anchorage to the ground.” Meyer addresses Le Corbusier’s fantastical vision in a critique of class structures and environmental concerns. She rejects the rigidity of Le Corbusier’s plan building a tower that rises magically and transgressively like Brazilian favelas. She relates her process of construction to the game Jenga where each segment is placed by hand, then tested for balance before release into final position. The organic growth of favelas is reenvisioned in House of Windows with decorous façades that bring forward utopian concepts of collectivity and habitation. A closer reading reveals the tower to be an island of modernization, a proposal much like Le Corbusier’s where wealthy inhabitants live under the aegis of the mechanical era. Here, we see a labyrinth of hexagon chambers where ocular lens-shaped balconies (sky-porches) regulate mental and social life through an arrangement of proximity that creates surveillance and voyeurism. Within this composition the interior architecture becomes an imagined dystopian jumble of odd and cramped spaces. The embedded subjects of Meyer’s installation center on abstraction where the social space is purely mental, but the composition is attuned to the scenic. In House of Windows, inhabitants observe nature through acrid and cool-tempered plexiglass windows that put nature on a pedestal to be observed at a distance. Meyer has made invisible the mechanical systems that such constructions require favoring an American eye towards the monumentality of the great outdoors and away from interior mechanics. Evidence of the world beyond is found in her addition to the composition of a manufactured toy-sized deer. Positioned at the ground level of House of Windows, the deer offers both a sign of scale and a selling point. It furthers the fiction of Le Corbusier’s Plan Voisin, which attempted to make access to nature appear integral yet kept at a tamed distance and subordinate to technology. 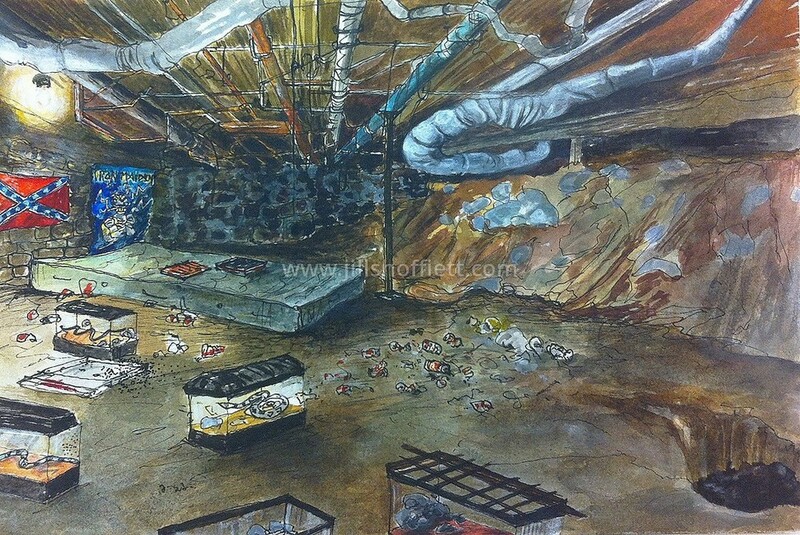 Jill Shoffiett’s ludic watercolors identify the absurdity of domestic architectural space as contained and secure. Her haunting mash-ups present performative scenarios of what happens when the humans exit the house. In Darrell’s Party Hole, Shoffiett creates an archeology display of rebellion and entrenchment. We enter a basement, more of a dirt cave, with artifacts of subterranean life: fish tanks with rattlesnakes, beer cans, Iron Maiden and Confederate flag posters, and a bare bed. The architecture is a service system where the anatomical bowels of the house hang in a cluster of MacGyvered air conditioning vents and electrical circuitry. From the viewpoint of the inhabitant, this life giving system for air and light is inconsequential. The space centers on a more psychology existence; it is a holdout, a retreat from the social order. In Shoffiett’s work the viewer is often positioned as if they were about to observe the aftermath of a potential tragedy. Watercolor lends a loose and dreamy sweetness to the daunting events being displayed in her images. In took myself a wrong turn whilst homeward bound, Mamie (a serial protagonist in Shoffiett’s work) makes an appearance as a cookie jar living in cyclone alley. Here we see the suburban kitchen of a drug-addled inhabitant. Drugs have been taken—bottles and bottles are strewn. A toy figure of an Indian on horseback sits at eyelevel on a countertop and prepares to fight the nearing tornado. A Doberman Pinscher slumbers on the floor to make the image more menacing. More narrative than the other artists’ work in Odds & Ends, Shoffiett magnifies the void of the suburban home presenting it as a site of psychological disorder, an enclosure that attempts to dominate nature by encroaching on the landscape where wild things happen. In 1967, the same year that Dylan retreated to basements around Woodstock, the recalcitrant painter Philip Guston moved there. In Woodstock, Guston would renounce abstract expressionism and return to the representation of his early years. His motto became, “we are image-makers and image-ridden.” In Odds & Ends we see Guston’s signature cartooned shoes, cigars, and big eyeballed heads with distorted sculptural bodies, arrive in post-script in the work of Jeff Starr. Recalling Guston’s spirited, and often political subjects, we find Starr remastering similar themes of individuality and society, interiority and exteriority, observation and surveillance. Unlike Guston’s limited newsprint-toned palette centered on blacks and whites smeared amongst reds, Starr’s paintings offer a tetrachromatic vision that reflects information systems today. In Starr’s Le Freak we see a hybrid monster-head teaming with information and images like the interior of a metropolis that is also an archive of collected memories and outtakes from popular culture. Built on a dainty foundation of a single shoe and a pilotes, the beast is architectural and surreal. Its form is both blob and humanoid filled with color that lifts off from chartreuse brickwork. Starr has imagined a portable shelter that vibrates with West Coast amplification. Here, we see the friction of LA’s urbanism and the drift of San Francisco’s graffiti–inspired culture of Beautiful Losers. Decapitated celebrity icons such as Kanye West swirl in a pastiche of visual chatter: scribbled spirals and loops, cartoonish doodles, and architectural debris. This monster’s headspace is a virtual nomadic laboratory. In the painting Muchmore, another hybrid monster-head rests on shoulders formed like a plateau. With this image Starr recaptures the weightiness of a Guston figure scrutinizing the interior life of the domicile or the built environs of the cityscape. Starr’s monster-head, in profile, is a house. The figure’s mouth gapes like an open door while the back of its head ventilates the activity inside through a tube or chimney. In the upper left corner, a vagabond exits or escapes the interior chaos, stepping off the mainframe shelter into a field of abstraction. His knapsack, made from a stick and handkerchief, suggests he is a flaneur, but also a traveler bound to return to this colossal inner world. Starr has retained the mood of a culture maligned by technological overstimulation and loss of privacy. He posits this reality against the concept of the mobility not only of information systems but also of architecture. As architectural historian Reyner Banham theorized in the 1960s: a home is a shell; plumbing, heat, and air conditioning are portable. Returning to Dylan’s Basement Tapes, we review that basement space offers us only signs of the architectural; it belongs to a set or system of enclosures and is most often the space for architectural utility and storage retention. Rarely taken seriously—there is no theory of basement space—such a space can only be seen when you are in it. By further considering basement space through Odds & Ends we enter the language of escapism and the fictions of spatial solidity. Man cave, shag pad, hibernation chamber, teen lair, bunker, storm shelter, dungeon, and dark room. Formed by their interiors, basements seem to ready the mind for performance or action above their mostly subterranean grade.